Standing ovations, smiling faces, tears of pride, laughter and wonderful musical performances – ECMVC’s concert in St Luke’s Church, Loscoe, on Friday 12 October, with the Howitt Primary School Choir from Heanor demonstrated just how powerful singing in a choir can be. The church was packed and the audience overflowed into the reception area. The children were superb and sang a great variety of songs which showed off just how accomplished they are, despite their young age. A great testament to the hard work of the school staff who manage their practices and performances. If ever there was a perfect advertisement for singing together, this was it, with Eastwood’s well-established and respected male voice choir blending brilliantly with voices many years younger. Both choirs treated the audience to a selection from their own repertoire before joining together to perform ‘Somewhere Over The Rainbow’ and ‘Thank You For The Music’, which brought the audience to their feet for a long and very loud standing ovation with lots of requests for us to do it again. A fabulous end to a magical evening. ECMVC has one more evening of superb entertainment lined up for Eastwood this year. 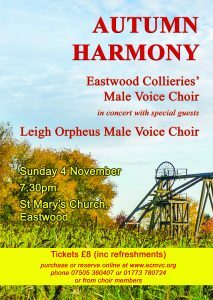 Following hard on the heels of the hugely successful Summer’s End concert, Autumn Harmony, on Sunday 4 November at St Mary’s Church, Eastwood, will once again provide a fantastically varied programme of items from two well-respected choirs. Expect many classic songs from the shows as well as popular pieces and standard male voice choir items, old and new. Tickets are £8 (£6 if you attended the Summer’s End concert and still have your ticket) and can be reserved by calling 01773 780724 or 07505 360407. You can buy tickets via choir members or, alternatively, you can email info@ecmvc.org or purchase and reserve tickets online via the choir website – www.ecmvc.org. Previous Entry: Summer’s End – great success!